BBQ Basics will be held 10am - 1pm on Saturday 1 June 2019. BBQ Masterclass will be held 10am - 3pm on Sunday 2 June 2019. Learn the skills and gain the confidence to start charcoal cooking with consistently great result as well as introduce Low n Slow BBQ Smoking into your repertoire. Taught by an experienced pit master and the 2018 Grand Champions in the Australasian Barbecue Competition circuit. A hell of alot of food for you to taste, all while trying to digest some of the best info going around on how to cook it yourself. 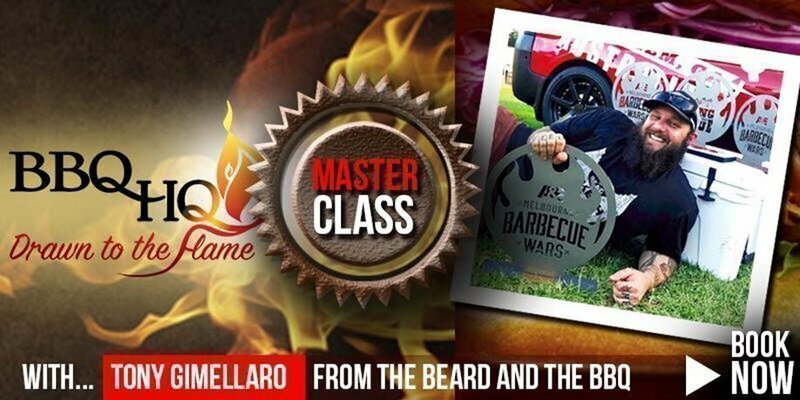 Join us at Barbecue HQ for a full day BBQ Masterclass from an award-winning pit master! We are bringing in one of the best in the biz to Darwin, Tony Gimellaro from The Beard and the BBQ. A Sydney based team who recently took out the number 1 spot in the Australian Barbecue Competition for 2018. - Walk through of brisket trimming, slicing and eating! Everything we cook you eat! This is practical class using a variety of live pits so you can get up close and personal. Walk away with a full belly and some excellent knowledge to up your own BBQ game. This class sold out quickly last time so don’t hesitate, buy tix now. - Seats are strictly limited so don’t wait, buy your tix now! - Note: Price is all up, with no additional ticketing fee.